I was born in McPherson, KS, a small Midwestern town of about 10,000, about an hour away from Wichita. It was an idyllic childhood. We lived on the edge of town, and our backyard extended out into a wheat field, so it was a grand expanse that went off into the horizon. Half a mile beyond the house were railroad tracks — this all was our playground. I loved building tree houses and forts. Tonka toys on dirt hills. We had the Great Tomato Wars in the summer of 1962. We had a lot of imagination in our play, and we were free to roam the neighborhood without fear of anything. My father was a medical doctor and had a private family practice in town. Being a small-town doctor, he did everything: fixed broken bones, delivered babies, stitched up cuts. He loved his work, and he loved to hunt and fish. He combined his two hobbies by making house calls in the county. He taught us by example and with philosophical words of wisdom. My mother was a homemaker and a counterbalance to Dad. Whereas Dad was "strictly the facts" about treating people, Mom was the spiritual counselor. She loved to talk to people and give home remedies. The first hint of what would become my life's passion came in grade school when I wrote that I wanted to be an airline pilot so I could see all the world. Looking back on it, that was my first urge to travel. Later, I wanted to be in the Peace Corps; I wanted to see the world, and I wanted to do good in the world. Another thing that played an important role in my love of travel is that we took a summer vacation every year to a lake in Canada. I remember the buildup, packing the car, getting the maps ready. When we crossed the border, it was always so exciting because the money changed, the soda pops were different, the look, the smells. The idea of play, running away from home, and adventure was inside of me at an early age. One thing was clear, though, as I looked around McPherson, KS: There weren't a lot of career opportunities. There weren't writers or advertising agencies or any creative-type jobs. I had grand visions of traveling everywhere I could think of. I always liked to read. It was a pleasure. As I got older, the outside world started to come in. Going off on "The Great Adventure" began taking shape in my mind. After I got my driver license, I would just drive around those country roads, listen to AM radio, and think about things. I loved driving and cruising around. I started to feel restless. I went to Kansas University. At that time, going to Lawrence was a pretty big adventure, and I was ready to go. Once I got there, though, I realized that I didn't really have a burning purpose to declare a major. After my sophomore year, in the spring of '72, a very good friend of mine —Jim Alldritt — who had the same kind of imagination I did said, "Man, let's hit the road." So we split, and I never went back. I traveled around, did odd jobs, and saved my money. Jim and I decided to do a backpacking trip in Europe in 1973. We flew into Luxembourg, came through Paris, hitchhiked down through southern Spain. We got to Barcelona, and decided the trip didn't feel like "The Big Adventure"; it didn't feel foreign enough. We flew to Nairobi. I spent six months there, climbing Kilimanjaro along with traveling to northern Kenya, Uganda, Tanzania, and Rhodesia — known as Zimbabwe today. It was a grand, non-touristy adventure of experiences, and it changed me dramatically. Back in McPherson, I became a welder to earn income. After four years, I returned to college. I chose the University of New Mexico because it was a foreign environment inside the United States. I graduated with an industrial arts degree in 1984. I had told a professor that I wanted to work overseas somehow. He told me to look into teaching English as a Second Language, that it would be my ticket to world travel. I got a master's in ESL in 1985, and that July, I went to Saudi Arabia for a year. Over the next three years, I traveled and taught in Africa, the Middle East, Israel, Jordan, Syria, Turkey, Greece, Italy, France, England, and Indonesia — which is where I got the idea for the American Dream Safari. I was 38 years old, and I had some time off from teaching during the week of Ramadan in 1988. I wanted to climb Mt. Bromo. As I got to the approach, there was a French couple hanging out and drinking beer. We started talking, and they expressed an intense desire to come to the States and sightsee. They asked me where they should go. On a napkin, I started mapping out a tour for them across the U.S. They asked, "Can we rent an old Cadillac like we see in the movies?" And bingo. I saw what I'm doing today in a flash. Building my touring business was an adventure in itself. There were missteps and false starts along the way — this was all pre-computer, remember. But the passion was in me, and I learned the industry, did what I had to do, developed a variety of tours, and am traveling the road of the American Dream Safari. The name "American Dream Safari" came from … After I had my epiphany in 1988 in Indonesia about starting a touring company, I wrote to a longtime friend and told him about my idea. I wrote, "It's like our African safari, but instead, it's going to be an 'American Dream' safari. And there was the name! My first business step when I got back to the States … was a phone call: "Hello, insurance company, can I do this?" They'd never heard of anything like this before. I got my 1950 Buick ready to tour and modified the Airstream trailer. My first tour … was for the French couple who gave me the business idea. I picked them up in Denver, drove through the Rockies to Mesa Verde, Grand Canyon, Vegas, L.A., San Francisco. Twenty-five days, pulling the Airstream trailer for them to live in. It was a safari — a truly grand adventure — and it worked! Since opening my company, the number of miles I've driven … total, more than a million, certainly. My first hard lesson … was after the grand adventure in 1989. I was very naive. I thought I could just go cold-calling around L.A., introduce myself to travel agents, and the tour assignments would flow in. I didn't even have a business card! So I went to work as a carpenter, and I'm living in my Airstream trailer on the streets of L.A.
My second tour route … By 1993, I had the Route 66 Tour down pat. But this is the American Dream Safari, after all, so I needed more tours — the Blues Tour, the New England Tour — and I was going to cover the whole gamut. My 1955 Cadillac … came by way of a blues tour I was selling between New Orleans and Memphis in 1995. I decided that instead of using my grandfather's '50 Buick for touring, I'd buy a '55 Cadillac, completely restore and adapt it, and drop a 350 Chevy motor into it. That was my first real business car. Interestingly, although I had been in communication with many people in Memphis during my research for this tour, I had never been to Memphis before. So I roll into town and visit Graceland. Inside the car museum was Elvis's pink '55 Cadillac. Boom! My greatest extravagance … is a 12-pack of Miller Lite! But if I had the money, I'd blow it on more Airstream trailers. A successful tour … A lot of it is dependent on what the customer is bringing to the tour. I know the questions to ask the customer so that his tour meets his expectations. The result of a good travel experience is … enlightenment. The equation is: encounter + acknowledge + engage + exchange = enlightenment. If my work is done well, you're going to come away from an afternoon in Memphis saying, "I get it." As kids our holidays were … Norman Rockwell-ish. Thanksgiving fell near my birthday, and for a long time, I thought Thanksgiving was a holiday in honor of my birthday. My most treasured possession … is my imagination. Therein lies the well of all my inspirations. My first impression of Memphis … I was 44 when I came to Memphis in 1995, and it was a bit of a love–hate relationship. It was hot. I entered the city from the south on Hwy. 78, and looking around, I didn't feel impressed. My first night on Beale Street was during the middle of the week. It was raining. No one was there. I'm at Rum Boogie enjoying the music. When I leave, the street is still empty except for a tipsy couple dancing up Beale Street, disappearing into the mist and rain and neon glow. I thought, "Well, maybe I should look at Clarksdale or Oxford instead. But it became obvious that I needed to be in Memphis, and certainly, the town grew on me. This is my life's work, and it has culminated in Memphis, and Memphis has all the things I need and want. A touring lesson I learned … In Joseph Campbell's book The Hero with a Thousand Faces, he says that at some point in your particular journey you'll lose faith and question yourself. Sure enough, no matter what the tour's duration is, about three quarters of the way through, there's a lull, a tiredness. And then the energy picks back up. Some of the best professional advice I received … was from an old hand who said, "Look, you may have told this story 1,000 times, but it's the first time this customer has heard it." It takes a lot of time to … learn the little nooks and crannies of a city. That is what makes for a memorable tour. My first job … I always loved to work. I liked having spending money, and I thought of work as fun. There was a guy who had a golf driving range on the outskirts of town. He needed someone to go out there at 6 a.m. and pick up golf balls. So the summer after my 5th-grade year, every morning at six, I'd jump on my Schwinn bike and ride out there. I didn't want to become a doctor like Dad because … I just didn't drift naturally toward the subjects needed to become one. I also saw that it wasn't such a glamorous job as others might think. Every night, he got called out. I don't recall any nights where we didn't hear his footsteps at 3 a.m. going to the hospital for an emergency call. Phones ringing all the time. There were no cell phones, no voicemail, no answering machines — just the one landline phone. For most of my adult life, I've … lived in storage units. I'm living in one now! Growing up, religion … We went to church every Sunday — Protestant. Two of my Sunday School teachers didn't teach Bible lessons; they taught philosophy. My father really wasn't religious; he was a scientist. His truth was in facts, and if you wanted to find God, you could find Him through facts. Religion was part of the routine of life in a small Midwestern town. A successful tour operator must have … an encyclopedic mind and an empathetic ear. A tour that didn't work … I concocted a 21-day blues tour from New Orleans to Memphis to Chicago, but no one bought it. Who has 21 days to spend on a tour? A friend of mine said, "The tour you're offering is everybody's favorite imaginary tour that they can never take." It was an impractical notion. I became interested in old cars … In 1975, my grandfather passed away and left me his 1950 Buick. I took some antique restoration classes at night, and I developed an interest in collecting and restoring old cars. I bought my first Airstream trailer to go with my 1950 Buick. I just started collecting stuff. People might be surprised to learn that I … built and live alone in a 7,000-square-foot indoor trailer park inside an old warehouse Downtown. I have four Airstream trailers, and I sleep in each of them, depending on the season. My imaginary indoor trailer park … I've lived here for five years. For seven years prior to that, I lived at Talbot Heirs Guesthouse and was their night manager. 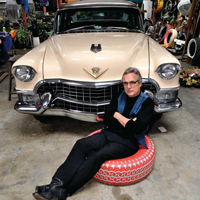 The car was on the street, and I wanted a safe place for it — as well as a place to work on it. Also, I had four trailers and a lot of "stuff." This building was full of dead cars. I got those out and started shoving my stuff in. I decided to live here. The worst advice I was given … was to buy a modern car — or a van — and shuttle people to the airport. The time I was most afraid … as a businessman, I have dark, dark nights at times, worried about losing my business. There's no safety net as an entrepreneur. There have been a few times over the years that I thought I might not be able to continue on with my dream. From my father I got … the passionate pursuit of my work, certainly. We were two different kinds of guys. He loved chemistry and physics; I loved poetry and philosophy. If I had to choose between giving tours and creating my art … Oh, giving tours, hands down. I started painting tires for fun seven years ago. I make planters and chairs. I like hillbilly/folk art, the concept of trailer trash, trailer parks — in a positive Americana way. I have never … been married, had children, owned a house, or paid for anything with an American Express card. At some point, every entrepreneur needs … some luck. I've put in a lot of hard work, but a lot of this happened serendipitously. My philosophy of tourism … is called anthro-tourism. The "tourism" industry is more about the destination; "travel" is more about the journey — experiencing culture and experiences along the way. The word "safari" is Swahili for journey. Anthro-tourism is where you go into the local culture, the local economy, and you spend money in a local way. I'm not interested in doing 40-passenger bus tours to the hot spots. The best part of this job … I've seen a lot of interesting people and stories on my tours. That's the most fascinating thing about my work: the people who have sat in my car and told me of their dreams and memories. My most requested tour … is the general city tour, called the Greatest Hits Tour, which showcases Memphis, music, and the city's icons. <My final 2 cents … The things that you do when no one is watching are the things that show your true character.